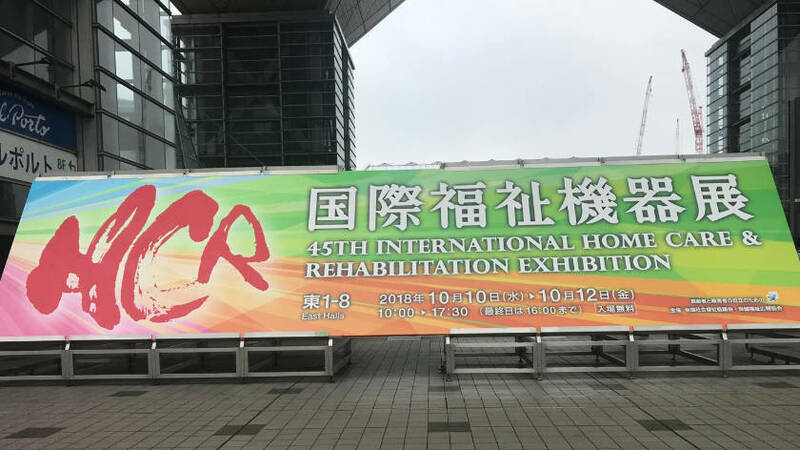 On Thursday, October 11th, 2018 I had the opportunity to visit the 45th International Home Care and Rehabilitation Exhibition (HCR) at Tokyo Big Sight in Odaiba, Japan. The three-day exhibition is the largest of its kind in Asia and features products from a wide range of vendors, including but not limited to large industrial retailers and small personal outfitters. Over 560 retailers from more than fourteen different countries were represented, showcasing everything from cutting-edge robotics to daily living utensils that had been modified to support the lifestyles of persons with disabilities. The HCR also featured an international symposium on the current status of assistive technologies in Japanese schools and workplaces, as well as a seminar on elderly care and a Paralympic sports demonstration. Truly, the event was a remarkable sight to behold. Words cannot do justice to the feeling of walking into the HCR convention space. It was as if I had been transported to a magic world: a world filled with modified toilets, floating prosthetics, and a ton of expensive-looking wheelchair-accessible vans. At every turn, I ran into another wheelchair user (sometimes literally) and had the opportunity to see just how many ways people lived their lives. Most impressive was the sheer scale of the event, which covered multiple football fields (American or European, take your pick) and seemed to go on forever. Of course, the assistive technologies themselves were nothing to scoff at, and I was particularly impressed by some of the ways that manufacturers had tried to accommodate aspects of Japanese culture into their designs. A wheelchair accessible hot-spring, for instance, is something that I’d never thought of before. Likewise, a set of bionic legs seemed to play right in to the ‘Japan as Robot Utopia’ trope that gets played up (sometimes too heavily) while still providing an incredible amount of functionality. This was innovation at work in the best kind of way, and I was awestruck to say the least. If I was impressed by the technologies available at the HCR, I was equally scared of them. Many emphasized the fact that persons with disabilities are often without caregivers or individuals to support them through their design, either explicitly or implicitly. For example, a sensor grid was displayed that sought to capture the motion and activities of elderly and impaired individuals and alert a remote monitoring company in the event of an emergency. I also saw an automated surveillance robot roaming around the facility and streaming video of HCR participants to its associated booth for similar purposes. The logic behind such technologies is clear: Japan has many disabled individuals, and there aren’t enough people around to assist them. 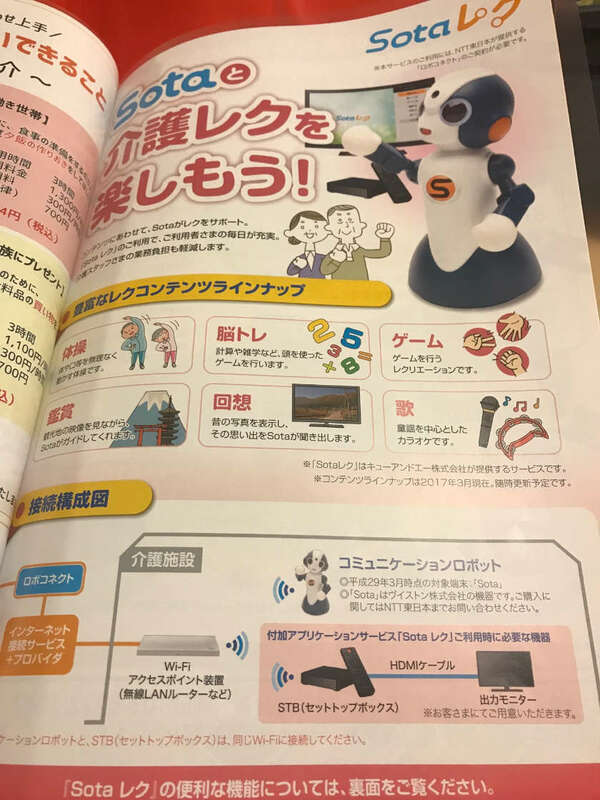 The situation will only become more severe as Japan’s population continues to age in the coming years, and as such it stands to reason that manufacturers like NTT are creating products like “Sota,” a robot that can entertain people with disabilities and ensure that they do not get too lonely. As a scholar of disability in Japan, I’m left to wonder about the kind of kinship formations and access opportunities that will be enabled by assistive technologies like Sota. But that’s a conversation for another day. Suffice it to say that my trip to the HRC was extremely fulfilling, and I won’t forget it anytime soon. I entered with low expectations and left with high praise (and more than a few ethical queries). I suspect that if I’m in Japan again next year at this time, I’ll return to the event. Indeed, I’m very curious to see how the event changes as time passes. If hearsay is anything to go by, each year brings a slightly larger crowd, along with more booths and technical innovations to witness. I look forward to seeing you all there, so that we can mutually take part in the wondrous space of access and accommodation!